If the testator only deeded away part of the specifically devised property or a percentage interest in the whole, the beneficiary may receive the remainder upon probate even though the will stated he was to receive the entire property. Some state courts may attempt to determine the testator’s intent when deciding a property dispute involving extinction by ademption or by partial ademption. If the court decides that the testator did not intend to disinherit the named beneficiary, it may rule that the specific bequest should be interpreted as a general one and allow the beneficiary to inherit other property or money in its place. One of the key components of property transfer is deed delivery. A gift deed that is not delivered, meaning it is not given to nor accepted by the grantee or property recipient, does not convey property. If the deed is delivered to the recipient’s attorney, trustee or other person to hold on her behalf, however, delivery will likely be considered complete. If the property owner prepared and signed a deed and placed it in his safe deposit box for delivery after his death, then the property may transfer through the will instead of the undelivered deed. Property conveyed by a will generally transfers upon probate subject to debts or claims against the estate. A relative or other caregiver who was in constant contact with an elderly property owner prior to his death may have convinced or deceived the owner into gifting property to him that was intended for a beneficiary under his will. If there is sufficient proof that the property owner was unduly influenced or mentally incompetent when the gift deed was signed, the court may set the conveyance aside. North Carolina Estate Planning Blog: I Inherited Real Estate - Where's my Deed? A will is a legal document that dictates how the property of a deceased person is to be distributed amongst his friends and families. It is drafted by the deceased before his death, and it may identify that specific assets go to specific people. 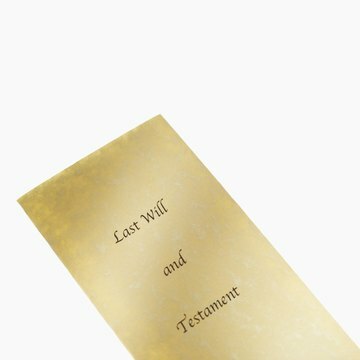 During the time between when a person drafts a will and when he dies, the will maker may make verbal gifts of property, which are referenced in the will, to other people. As a result, there may be some confusion regarding who receives the property -- the person named in the will -- or the person who received the verbal gift. Normally, trusts are used to keep property out of an estate. Having property included in probate delays its distribution to the heirs and beneficiaries of a decedent. Placing property in trust prior to a person’s death keeps it out of this probate process. However, a person may decide to have property placed in a trust after his death for other reasons. In such a case, a deceased person’s estate may give property under a trust. A beneficiary deed allows the owner of property -- also known as the grantor -- to pass property directly to a beneficiary upon the grantor's death. With this document, the property does not have to go through probate or subjected to gift taxes before the beneficiary can take legal title to it. Although a beneficiary deed can be quite helpful to those inheriting property, both grantor and beneficiary should be aware of the consequences of allowing a beneficiary deed to stand even when circumstances change.